Surnalli is a thick dosa. Cheppi in Konkani means bland. That doesn't mean this dosa has a bland taste. It is only used to differentiate it from Godi Surnalli which is sweet. As I have mentioned before Surnalli can be made using watermelon/cucumber/ash gourd. This time I have used cucumber. Surnalli is my favorite among all dosas. Amma always made the sweet version of surnalli as she knows that I love it. But recently I tried the Cheppi Surnalli and we liked this one too. Cucumber - 1 small or half of big one. Soak rice for 2-3 hours. Remove the skin of cucumber and chop it into small pieces. Soak the poha and bread in little water. Grind all ingredients except salt into a fine batter adding water. The batter shouldn't be too thin. The consistency of the batter must be thicker than regular dosa batter. Ferment overnight or atleast 8 hrs. Next morning add salt and mix well. I also add a pinch of baking soda to the batter as the batter doesn't ferment well in winters. Adding just a pinch of soda gives nice fluffy surnallis. Heat a tava or non stick pan. Add a few drops of oil/butter. Pour a ladle of batter in the center of the tava. Do not spread the batter. Drizzle some oil on the sides. Cover and cook till it gets golden from below. Serve with your favorite chutney or sambhar. Don't forget to top it with a dollop of butter. You can also make small mini surnallis for kids. Note: Surnallis are usually cooked only on 1 side. But I like to cook it on both sides. For making the sweeter version of this just add some jaggery in addition to the other ingredients while grinding the batter. 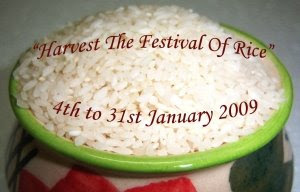 Sending this along with Undi to "Harvest the festival of Rice" event. Also sending this to FIC - Yellow Event at TongueTicklers. Our preparation for surnali is quite different but this sounds healthy too with cucumber stuff. Though i make thousali or bhakri with cucumbers. hubby loves cheppi surnali and me loves godi surnali.. I add so much jaggery that when it cooks it shud leave little bit of paank kind of stuff at top! I checked your version. That looks great. My amma usually adds cucumbers/ash gourd/ watermelon to surnalli. I just followed suit. I too love lots of jaggery in my surnalli. Amma always added some additional jaggery on top of the godi surnalli for me. but then it would become paank and spoil the tava. so she made only the last surnalli in that way and i loved it. It becomes very soft and spongy. Do give it a try. My MIL makes this! Good recipe and yours looks very nice and spongy! Thanks for sending this to FIC! a wonderful recipe. Surnallis, I like these. delicious! Wow!! I love cheppi surnali. This dish looks so beautiful, sounds healthy. Thanks so much for sharing.